Mille Lacs Lake winter fishing regulations took effect Dec. 1. 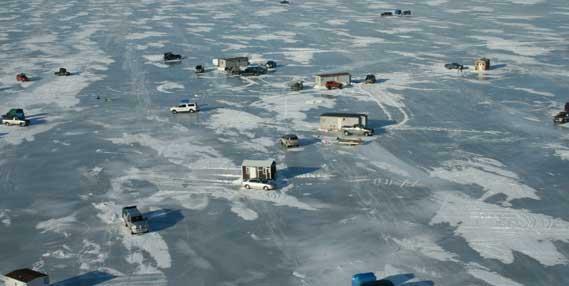 Home » Blog » Mille Lacs Lake winter fishing regulations took effect Dec. 1. Not normally included in our Brainerd Minnesota area fishing reports we do have many fishermen that run to Mille Lakes Lake on a regular basis so we thought we would share the new fishing regulations. Although not typically a lake that we promote there are those that do consider this a part of the Brainerd Lakes Area so for those Minnesota fishermen and women we thought we would share this info. Mille Lacs Lake is about twenty five minutes east of Brainerd and a very frequent visit for our local fishermen. This year anglers may keep one walleye between 18 and 20 inches or one longer than 28 inches. The winter walleye regulation extends through Sunday, Feb. 28, 2016. Minnesota DNR staff will monitor creel data throughout the winter. If angler walleye harvest appears likely to exceed this year’s 5,000-pound cap, catch-and-release walleye fishing would go into effect. State anglers harvested 3,100 pounds of walleye last winter. Tribal biologists and the DNR agreed Oct. 15 to set the winter harvest cap for state anglers at 5,000 pounds after September fish assessment data showed that pounds of spawning-age walleye and numbers of walleye from the 2013 year class were above established benchmarks. The Mille Lacs Lake northern pike bag limit is five. Each angler or spearer can keep one pike longer than 30 inches only by first harvesting and possessing two pike under 30 inches from Mille Lacs Lake on the same day and by keeping them in immediate possession. Anglers wishing to harvest a pike longer than 30 inches may not accept a pike shorter than 30 inches from another angler in order to fulfill the two-fish-under-30 requirement. However, anglers not harvesting pike larger than 30 inches may party fish for pike shorter than 30 inches. Consistent with statewide regulations, dark-house spearers are not allowed to party fish, which means each fish a spearer harvests counts only toward that person’s bag limit. Because dark-house spearers are not allowed to party fish, spearers are not allowed to accept pike from another person to fulfill the two-fish-under-30 requirement. Spearing for pike on Mille Lacs ends Sunday, Feb. 28, at the same time that the statewide angling and spearing seasons end. The angling season on Mille Lacs is extended through Sunday, March 27, to allow more late-season fishing opportunity. Permanent fish houses must be removed from Mille Lacs Lake by March 7. To find more information on Mille Lacs Lake management, Mille Lacs fishing, and spearing regulations, or for general questions contact the Minnesota DNR Information Center or call 888-646-6367 between 8 a.m. and 4:30 p.m. Monday through Friday. For our Brainerd area lakes the regulations are six walleye with only one being over 20 inches in possession. Northern Pike are 3 fish with only one over 30 inches in possession. The local exception is Round Lake where the limit is only one fish and it must be over 30 inches. Always check the Minnesota fishing regulations before heading out onto the water and be sure to follow our Brainerd Minnesota fishing reports.